From my newest deck to my oldest: Today’s card hails from the Druid Animal Oracle (my very first deck) and is a promising one. Blessings! 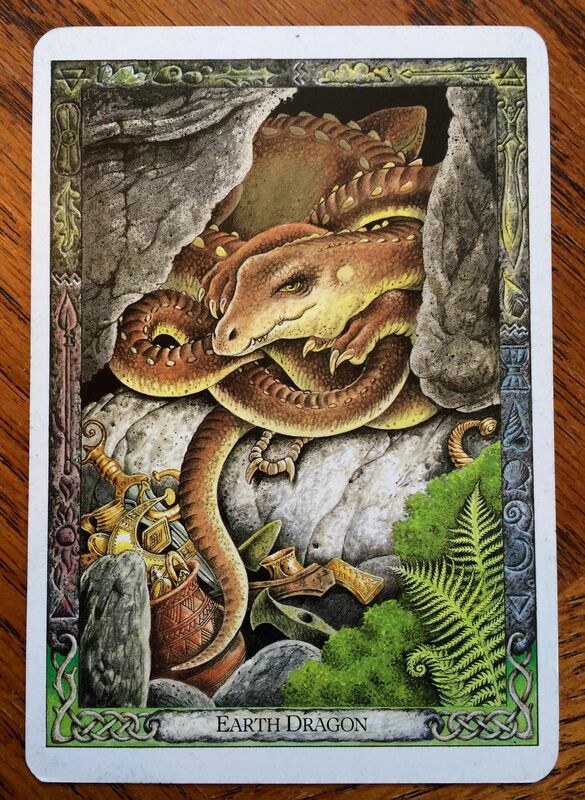 The Earth Dragon (Draig-talamh) brings us face to face with our potential. Wishing us we have a treasure house of riches – of powers and capacities – that we can learn how to use. In the past, we may have been denied access by the guardian of this treasure. But now we are coming to understand that this sometimes fierce guardian is in reality an aspect of ourselves. By coming to know and love Draig-talamh, we will be able to unlock the secrets of our heart, and at the same time we will find ourselves discovering the beauty and the power that lie within the hearts of those around us and in the very earth itself. This card might also indicate that somehow you are relating in an inappropriate way to your inner reserves and potential. Earth Dragon guard the treasures of your should fiercely, but he is your ally, not your enemy – do not try to kill him and do not try to wrest the treasure away from him. You may need to spend time befriending this creature who has slumbered in your should for so long. A precipitous attempt to capitalize on your talents or express. your potential may be unwise.